Kosmos 954 (Russian: Космос 954) was a reconnaissance satellite launched by the Soviet Union in 1977. A malfunction prevented safe separation of its onboard nuclear reactor; when the satellite reentered the Earth's atmosphere the following year, it scattered radioactive debris over northern Canada, prompting an extensive cleanup operation. The satellite was part of the Soviet Union's RORSAT programme, a series of reconnaissance satellites which observed ocean traffic, including surface vessels and nuclear submarines, using active radar. It was assigned the Kosmos number 954 and was launched on September 18, 1977 at 13:55 UTC from the Baikonur Cosmodrome, on a Tsyklon-2 carrier rocket. With an orbital inclination of 65°, a periapsis of 259 kilometres (161 mi) and apoapsis of 277 kilometres (172 mi), it orbited the Earth every 89.5 minutes. Powered by a liquid sodium-potassium thermionic converter driven by a nuclear reactor containing around 50 kilograms (110 lb) of uranium-235, the satellite was intended for long-term on-orbit observation, but by December 1977 the satellite had deviated from its designed orbit and its flightpath was becoming increasingly erratic. In mid-December North American Aerospace Defense Command, which had assigned the satellite the Satellite Catalog Number 10361, noticed Kosmos 954 making erratic manoeuvres, changing the altitude of its orbit by up to 50 miles, as its Soviet operators struggled to control their failing spacecraft. In secret meetings, Soviet officials warned their US counterparts that they had lost control over the vehicle, and that the system which was intended to propel the spent reactor core into a safe disposal orbit had failed. At 11:53 AM GMT on January 24, 1978 Kosmos 954 reentered the Earth's atmosphere while travelling on a northeastward track over western Canada. At first the USSR claimed that the satellite had been completely destroyed during re-entry, but later searches showed debris from the satellite had been deposited on Canadian territory along a 600-kilometre (370 mi) path from Great Slave Lake to Baker Lake. The area spans portions of the Northwest Territories, present-day Nunavut, Alberta and Saskatchewan. The effort to recover radioactive material from the satellite was dubbed Operation Morning Light. Covering a total area of 124,000 square kilometres (48,000 sq mi), the joint Canadian-American team swept the area by foot and air in Phase I from January 24, 1978 to April 20, 1978 and Phase II from April 21, 1978 to October 15, 1978. They were ultimately able to recover 12 large pieces of the satellite. All but two of the fragments recovered were radioactive. 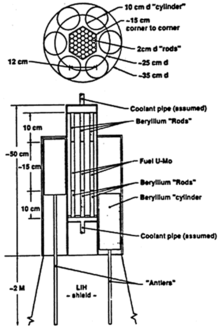 These pieces displayed radioactivity of up to 1.1 sieverts per hour, yet they only comprised an estimated 1% of the fuel. One fragment had a radiation level of 500 R/h, which "is sufficient to kill a person ... remaining in contact with the piece for a few hours." Under the terms of the 1972 Space Liability Convention, a state which launches an object into space is liable for damages caused by that object. 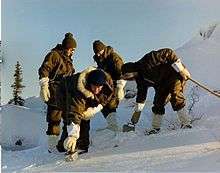 For the recovery efforts, the Canadian government billed the Soviet Union C$6,041,174.70 for actual expenses and additional compensation for future unpredicted expenses; the U.S.S.R. eventually paid the sum of C$3 million. Kosmos 954 was not the first nuclear-powered RORSAT to fail; a launch of a similar satellite in 1973 failed, dropping its reactor into the Pacific Ocean north of Japan. Kosmos 1402 also failed, dropping its reactor into the South Atlantic in 1983. Subsequent RORSATs were equipped with a backup core ejection mechanism — when the primary failed on Kosmos 1900 in 1988 this system succeeded in raising the core to a safe disposal orbit. Search teams did not find re-entry debris at the predicted location until they recalculated where that location would be based upon data indicating a stratospheric warming event had been in progress during re-entry. The stratospheric warming was first documented by the U.S. Army Meteorological Rocket Network station at Poker Flat Research Range near Fairbanks, Alaska. Kosmos 954 has become a well known piece of history and lore in Yellowknife, the capital of the Northwest Territories. Yellowknife painter Nick MacIntosh has created works of art featuring the satellite and well known local landmarks. The January 28, 1978 episode of Saturday Night Live featured a running gag about the radioactive debris from the crashed satellite having created giant, mutant lobsters heading for the US east coast, concluding with them invading the studio at the show's end. Wikimedia Commons has media related to Cosmos 954. 1 2 3 4 5 6 "Settlement of Claim between Canada and the Union of Soviet Socialist Republics for Damage Caused by Cosmos 954". April 2, 1981. 1 2 3 4 Reynolds, Glenn H.; Merges, Robert P. (1998). Outer Space: Problems of Law and Policy. Westview Press. pp. 179–189. ISBN 978-0-8133-6680-7. ↑ Weintz, Steve (November 23, 2015). "The Cold War near-atrocity that was nobody's fault". The National Interest. Retrieved November 23, 2015. ↑ "Nation: Cosmos 954: An Ugly Death,". Time Magazine. Feb 6, 1978. 1 2 3 Heaps 1978, p. 13. 1 2 "Cosmos 954 (1977-090A)". National Space Science Data Center, NASA. 1 2 Harland & Lorenz 2005, p. 236. ↑ Heaps 1978, p. 14. ↑ Heaps 1978, p. 80-81. 1 2 3 Benkö 1985, p. 49-51. ↑ Baker, Howard A. (1989). Space debris: legal and policy implications. Nijhoff. p. 66. ISBN 978-0-7923-0166-0. ↑ Benkö 1985, p. 50,78. ↑ Rendell, Mark. "The Fall, And Artistic Rise, Of Kosmos 954". EDGE YK. Retrieved 19 December 2014. ↑ "SNL Transcripts: Robert Klein: 01/21/78: Lobsters Take New York / Goodnights". Heaps, Leo (1978). Operation Morning Light : Terror in our Skies : The True Story of Cosmos 954. New York: Paddington Press Ltd. ISBN 0-7092-0323-3. Harland, David M; Lorenz, Ralph D. (2005). Space Systems Failures — Disasters and rescues of satellites, rockets, and space probes. Berlin, Heidelberg, New York: Praxis Publishing (Springer). ISBN 0-387-21519-0. Benkö, Marietta (1985). Space law in the United Nations. Martinus Nijhoff. ISBN 978-90-247-3157-2. Gus W. Weiss (Spring 1978). "Life and death of Cosmos 954" (PDF). Studies in Intelligence. U.S. Central Intelligence Agency.